Birdwatching 101: What’s In a Name? Jeancyn Alforque of ayala land, inc. writes about her first ever birdwatching experience with the WBCP in nuvali. My Friday started off like how it normally does – did some Autocad works, had a meeting about NUVALI engineering and design issues; and had lunch with colleagues. The only difference was that I headed straight to NUVALI in the afternoon for a birding activity initiated by the Wild Bird Club of the Philippines. I decided to join the activity because I saw it as an opportunity for me to explore NUVALI beyond the 2D drawings I plot on the computer. It was hot and humid, typical of a summer afternoon. The group was composed of various members from the Wild Bird Club and the NUVALI team, all prepared with their respective earth-toned outfits and gears. I considered myself unprepared, I even borrowed a few items from the NUVALI team. It may not seem so with the lack of preparation but I’ve always been a fan of outdoor activities, especially the ones that would give me the chance to commune with nature, so I was still enthusiastic nonetheless. The activity picked up with a briefing by Arch. Anna Gonzales, who is the current President of the WBCP and also the Sustainability Manager of Ayala Land Inc. I learned that bird watching is not only an activity for hobbyists who seek adventure or an opportunity to take good photos but it is also a way to help keep records of bird species up-to-date. I may even consider it an advocacy. Bird watching is an effort to raise awareness that these wild birds do exist and that we need to protect them. That NUVALI is able to reinforce this advocacy, with its clear consideration of the natural habitat as well as the ecology existing in the micro site whilst accommodating the built environment, is a huge feat in itself. On a planning standpoint, just like what Arch. Manny Illana (of ALP and also a member of WBCP) said, NUVALI was planned in a way that it will be delineated by natural edges such as rivers, trails, and open spaces. NUVALI fuses the built and the natural environment seamlessly, thus being the home to wild birds, other animals and us humans. After the briefing, we rode the NUVALI Van at around 3:30PM and headed to the location of the Wildlife and Bird Sanctuary. Even just along the NUVALI Boulevard, the group spotted a Blue-tailed Bee-eater. I didn’t see it though. Birdwatchers need to be alert for sure. We stopped at the entrance of the trail for a binoculars briefing. 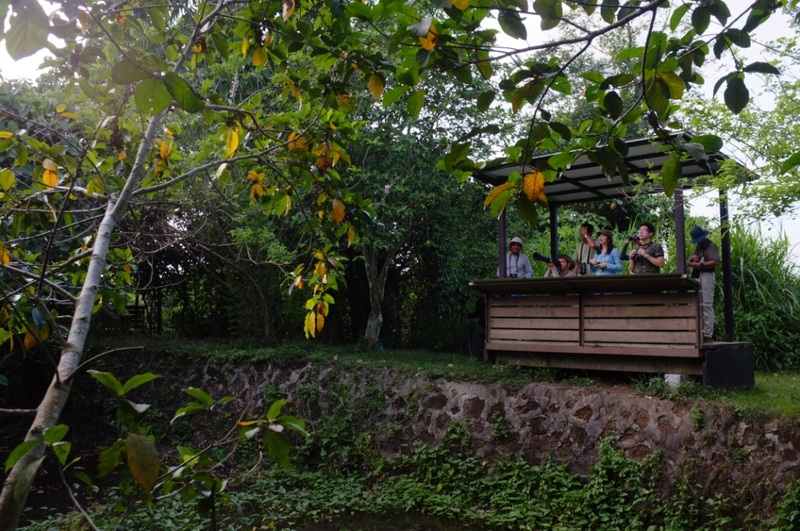 The first-timers were instructed on how to use the binoculars when we spotted a Yellow-Vented Bulbul, White-Collared Kingfisher and a Philippine Coucal. I wondered how they were able to tell it was a coucal at a glance even when there are several kinds of coucals. Turns out, there are certain species that are found in certain places and our location eliminates other similiar coucal species, and the Philippine Coucal would be the species to be most likely found in the area. We then saw Philippine Pygmy Woodpeckers across the road and there were many of them on an acacia tree. The binoculars were easy to use but the spotting scope was a great tool to look and observe the birds clearly and closely. It helped me see the details, colors and their distinct characteristics. 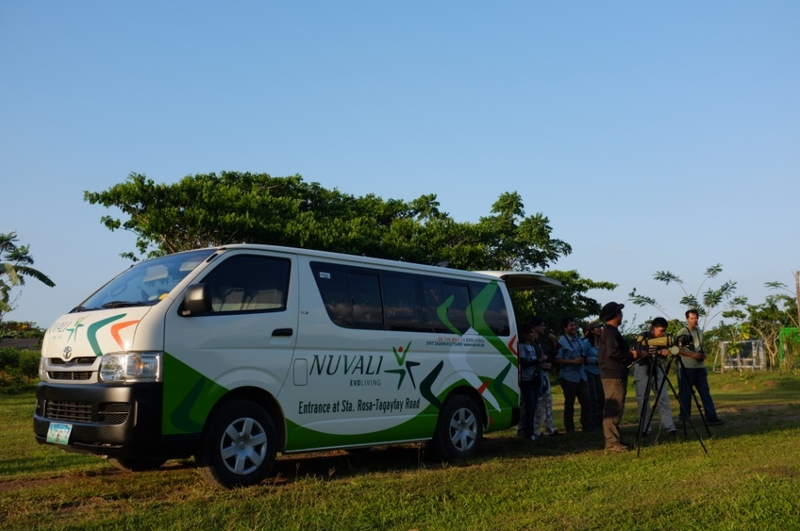 Birdwatchers with the NUVALI van. Photo by Manny Illana. The activity went on as we headed to the trail. We saw some more Yellow-Vented Bulbuls, Black-naped Orioles, Spotted Doves, etc. The excitement piqued when a Coppersmith Barbet landed on an exposed branch in an unobstructed view. We peeked into the spotting scope and I was awed by how colorful and distinct it looked. It has red, yellow and green feathers and even had whiskers. That was an unforgettable bird, for sure. We then went on walking along the trail while discussing as well the trees and plants we saw along the way. It was a very informative walk for me, getting to know nature in the littlest spectrum. Crossing the bamboo bridge, we saw a flock of Chestnut-Cheeked Starlings which are migratory birds. We got to the rest stop near the pond when we saw White-Throated Kingfishers flying across the pond. I vividly remember it was like a streak of blue and orange fabric that passed by swiftly. The colors were so bright they felt so surreal. Then looking back, while everyone was discussing different sorts of things, a group of Large-Billed Crows flew out from an African Tulip tree. It was Friday the 13th and there were 13 of them, something we just laughed about. The trek went on. Half of us continued walking towards the gazebo, out to the open area where the Elaro land development is visible and so is the Makati skyline. We saw a group of Scaly- breasted Munias perched on the wild grasses. Half of the group was left in the trail because they spotted two Guaiaberos. I knew we saw more species along the way, others I failed to remember, others I only heard and others I didn’t see. Entering the trail at Nuvali. Photo by Jon Javier. It was about 4:30 PM when the group decided to head on to NUVALI’s Greens & Patches, a tree nursery and demonstration site for urban gardening. We rode the NUVALI van again and on the way we saw three Red Junglefowls, one male and two females. They looked like hens and a rooster to me, more like the ones I see in the cities but the color of the legs would tell the difference. It was like we were chasing them so they ran along the road as fast as they could. It even turned hilarious because the 2 female jungle fowls were trailing and seemed like chasing the male. It’s mating season, no wonder. Spotting birds from one of the observations decks in the sanctuary. Photo by Manny Illana. Arriving at the Greens & Patches, we spotted two Pied Bushchats which seem to be on a courtship manner as they landed, hovered and perched on the plant signage. We also spotted a Long-Tailed Shrike on the Malunggay tree and a Brown Shrike on the Kakawate tree. Some of us suggested we go down the ravines to hopefully see some more interesting bird species. There were about twelve of us but only six decided to go down. I was one of them. It was my first opportunity to go down the ravines and I knew I’ve done some trekking before so I seized it without hesitation. It was fairly difficult, not much like what I’ve been through the Batad and Leyte mountains. When I finally made it down, I saw a stream that lead to a falls approximately 500 meters away. I wanted to see the falls but my outfit didn’t permit it so decided that next time will probably be better. We stayed at one spot when one of the bird watchers saw two Balicassiaos. It immediately flew away so we didn’t have the chance to see it through our binoculars. Suddenly, a male Indigo-Banded Kingfisher appeared on a rock in the stream. It was a surreal moment for the bird watchers. I saw it through the scope and it had distinct bluish-indigo and orange colors so I didn’t wonder why they were excited. It was beautiful. While still down at the ravines and waiting for more species to fly by, I learned about a certain species named Shama. For bird watchers, it is something worth-finding because it is rarely seen and it perches close to the ground making it more difficult to spot. One of the bird watchers somewhat heard it call. I kind of got excited a bit because I may be able to see what most bird watchers haven’t seen. We waited for a while but none showed up. He still has to validate the sound however. I remember it had a metallic sound, like a robot. We went back up at about 6PM and saw some more birds such as the Little Egret and the Black-crowned Night Heron. When everybody gathered at the Greens & Patches, we took group pictures. Honestly, I felt the chills down my spine while we were taking pictures. Not in my wildest imagination did I think I will be part of something like that when I was just in the office a couple of hours earlier. I didn’t think I will be able to take my earthy exploits to that level where I got the chance not only to see the birds up close but to meet people who know and genuinely appreciate these animals. It was around 6:30PM when we decided to head back to the Evoliving Center. We had a last stop when we checked the holes made by Bee-Eaters on the cut soil in front of Avida Estates. The day capped off with a rewind of the entire activity, listing down every species and the respective quantities with the aid of a field guidebook where birds are illustrated and described. All in all, my very first bird watching experience is something I thank God I did not let pass. In fact, my goal was just to experience NUVALI as a master planned development. I need that as an architect who only draws the lines and shapes that make up NUVALI through software. I’ve always wanted to give justice to the drawings I make by seeing it in actual myself. With this activity, however, I exceeded my goal. I did not only get to know NUVALI as a place but experience the life that thrives in it. With everything I’ve seen, heard and learned, I realize that it’s so easy to preach about sustainability and how essential it is to augment our current environmental conditions but we can never really fully understand it if we don’t take the time to go in, get our hands dirty and experience nature firsthand. Bird watching is a recommended activity for those who want to experience nature beyond just sight-seeing. It will not only educate us of the different bird species but will make us discover some other facets of the environment that we fail to notice. We don’t even have to be scientific nor technical. We just have to have some kind of eagerness to get to know the earth. At the end of the day, what will matter are the realizations that will bloom out of our experience. WBCP Survey Results: Why Did You Join WBCP? can anyone just join this activity? 🙂 does it have a specific day only? hope you can let me know as we are very much interested to join, along with my kids. Hi Christine! It’s great to hear that you are interested in birdwatching! 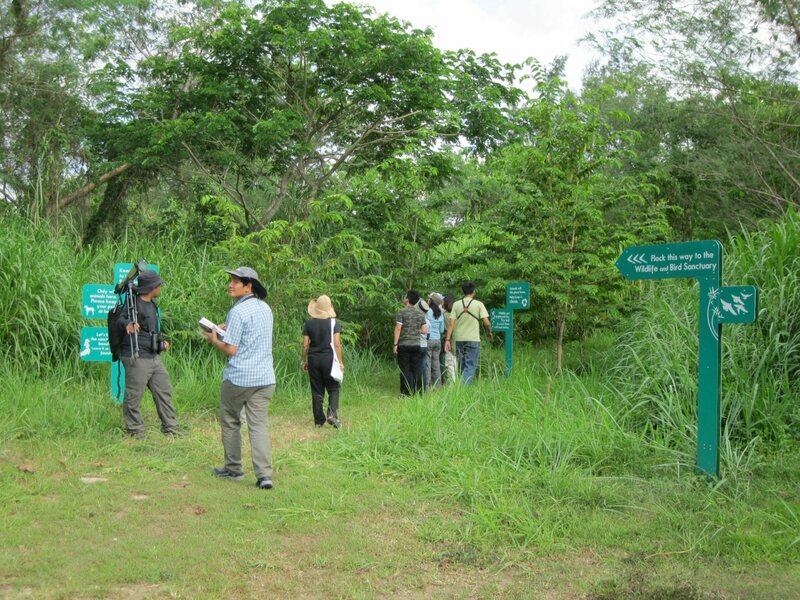 The Wild Bird Club of the Philippines offers free guided bird trips in different locations around Metro Manila. Please send an email to Mike Lu at myckle224@yahoo.com to be included in the mailing list for trip announcements. Please tell him you heard about birdwatching from eBON! You can also visit the website of the Wild Bird Club of the Philippines http://www.birdwatch.ph .